So how much would you pay for a computer that won't even run Angry Birds? How about £441,000? That's the price a rare Apple 1 computer recently fetched at auction. Didn't the buyer know that you could get about a thousand iPads for that sort of money? The computer was built by tech legends Steve Jobs and Steve Wozniak in Jobs's garage in the mid 70s. There are believed to be only 46 versions of the prototype in existence out of an estimated 175 to 200 that were made. It was shown for the first time to members of California’s Homebrew Computer Club in 1977. An anonymous Asian buyer bought the computer at auction in Cologne. Another Apple 1 fetched a similar price last November. There has been a sudden surge in value for the prized artefacts that were changing hands for just $2000 a time at computer fairs at the start of the century. The New York Times described the prices Apples fetch as inspired by "the economics of scarcity and techno-fetishism, magnified by the mystique surrounding Apple – one of the largest and most profitable corporations in the world". In terms of computer development, the Apple 1 was a vital step for computing from being a hobby for studious kids to becoming the global industry that Apple and Microsoft nurtured. 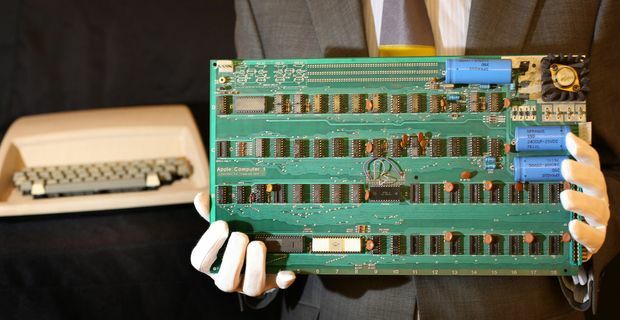 Wozniak's design provided a motherboard and cluster of chips that could run crude games and write basic programmes, with a memory of 4 kb. The Apple 1 missed several tricks that later proved instrumental in making Jobs and Wozniak billionaires. Its cassette interface ran any old tapes rather than just ones you brought through Apple's iCassette store. Its look was rather ugly and angular rather than curved and in pastel shades. It also failed to have an accompanying ad campaign suggesting that anyone who didn't own one was frankly pitiable. Is it time to buy an Apple laptop?